Now that you’ve got your foot in the door, so to speak, with the job you’re vying for, you need to be able to walk completely through it. This is done by nailing the interview. Your behavior during the interview says a lot about you, and it is something that the interviewer will keep in mind. If you are unsure about the right behavior, in the following sections, we will offer you a handful of expert tips on how to act at a job interview. The interviewer will have an idea about you before they even get the chance to meet you. And it is not because of your resume or application; rather it is because of the time you arrived for your interview. Get there a little early. Ten to 15 minutes early is a good range to arrive. Not only does it give you a safety net in case of traffic or something else happening, arriving early (but not too early) also shows that you are respectful of the interviewer and their time. Arriving too early is a big no-no paradoxically as you might unwittingly put pressure on the staff to entertain you by offering you coffee, for instance. When learning about how to act at a job interview, an important aspect to focus on is movement. Many people fidget, especially when nervous. However, it can be distracting to your interviewer. So, consider taking a few deep breaths before you meet the interviewer to try and calm your nerves. If not, consider investing in a discreet fidget toy you can use out of sight. Nothing can distract an interviewer as much as a candidate that uses many filler words (like ‘um…’). When you are answering questions, take a few seconds to think them over first and then begin talking. This method can help you avoiding the filler issue as you will be firmer about what you have to say. A top lesson about how to act at a job interview is how you sit. Do not slouch in your seat. Square off your shoulders and sit up straight. A good posture will help you boost your self-esteem and radiate confidence. If you don’t think you can do it, consider practicing a few times at home. Keep both your feet flat on the ground while at it. But fixing your posture is not enough. Make sure you go through a thorough preparation for the interview, covering every single aspect of your appearance and attitude while doing all the necessary research. Holding a “stare” during the interview is something that can be uneasy for many people. Even still, it is necessary that you look the interviewer in the eye several times throughout the discussion. Consider maintaining eye contact for a few seconds before looking down at something else. However, there are a few things that you should not, under any circumstance, focus your eyes on. The door and windows are always terrible ideas. This can send the (wrong) message that you wish to leave or be someplace else. Don’t even consider checking your watch or phone. The interviewer might feel rushed. Instead, fixate on the interviewer and, with a confident voice, ask them about the business, your future responsibilities, or training opportunities. A good candidate will always be genuinely interested in the company and the position they are applying for! This may seem like a no-brainer, but it pays to be nice and polite especially to your potential colleagues. 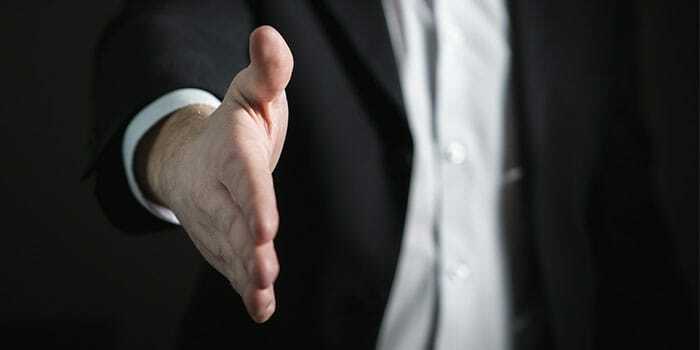 When you first meet your interviewer, smile and shake their hand while keeping eye contact as much as you can. This shows that you are giving them your undivided attention. Also before the interview, don’t forget to put your cell phone on silent mode if you don’t want a distracting ringtone to play in a quiet room or in the middle of the interview. A another bad idea would be to put your phone on the table during the interview. It sends the message that interacting with the people that might call, text, or e-mail is more important to you than paying attention to the interviewer. Both before the start and end of the interview, show that you are thankful for the opportunity. A proper handshake and a nice smile can go a long way. Be sure to vocalize your gratitude when you come in as well as when the interview is over. Not everyone knows how to properly act at a job interview, but a candidate’s behavior during the interview can leave a lasting impression on their potential employer. If you want that impression to be positive, focus on your physical appearance and the way you carry yourself. Keep in mind that as long as you exude confidence, your peers will believe you have it too. Also, consider our seven tips on job interview etiquette before the big day to steer clear of some of the most common interview mistakes.